To celebrate the pioneering scientists featured in the 2018 edition of Heroes of Health we will be writing articles about each of those featured. Front cover of Almroth Wright’s story in Heroes of Health, illustrations by Lindsay McBirnie (left). Portrait of Sir Almroth Wright, Credit: Wellcome Collection (right). Having graduated from Trinity College, Dublin in 1883, Almroth held positions at the Royal College of Physicians and Surgeons, University of Cambridge and University of Sydney, and went on to be appointed Professor of Pathology in the Army Medical Services at the Royal Victoria Hospital where he stayed from 1892 to 1902.2 During this time, he noted the great suffering of men from typhoid fever, a bacterial infection that ended up killing hundreds of thousands of people during the First World War. 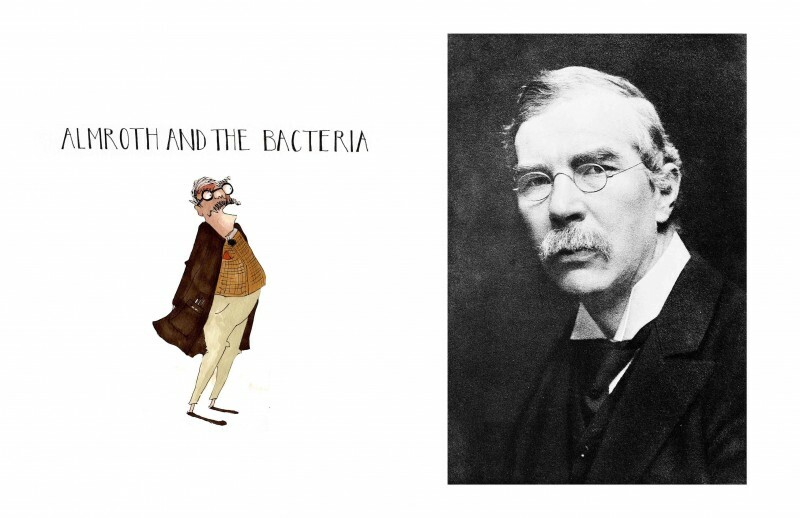 Alongside his work in diagnosis Almroth was incessant on finding a solution to control the symptom of fever. He worked tirelessly to develop a vaccine, trialling it on himself and surgeons on probation and finding it greatly increased the body’s ability to kill the typhoid bacteria.2,4 This was a great enhancement in the world of healthcare and has been described as “epoch-making”2 and once rolled out saved many lives. It is without doubt, that Almroth’s scientific legacy is immense and his work continues to influence immunologists of today having founded the Institute of Pathology and Research at St Mary’s Hospital, Imperial College London.2 Imperial hold an annual Almroth Wright Lecture series in which highly distinguished figures from the world of immunology discuss their research and share the current advances. It’s brilliant to note that this year’s lecture series sees the first all-female line up, with the third and final talk from Professor Anne Ferguson-Smith, Department of Genetics, University of Cambridge, Mammalian epigenetic inheritance – mechanisms and implications happening today, Tuesday 15 May. Almroth will continue to be celebrated for his “epic work in the science of immunology”2 and he is one of our Heroes of Health for this very reason, the very first icon of immunology. If you’re interested in reading more about our pioneering Heroes of Health, the first feature highlighted the career of Mary Barber: Hidden Hero of bacteriology. 1. IBMS History Committee, Health for Heroes, https://www.ibms.org/resources/documents/health-for-heroes-typhoid-vaccine/health-for-heroes-typhiod-vaccine.pdf. 2. In Memoriam. Sir Almroth Wright. (1947). Journal of the Royal Army Medical Corps, http://jramc.bmj.com/content/jramc/88/6/250.full.pdf. 3. Wright, A. and Colebrook, L. (1921). Technique of the Teat and Capillary Glass Tube…. 4. Colebrook, L. (1953). Almroth Wright—pioneer in immunology, British medical journal, 2(4837), 635. https://www.ncbi.nlm.nih.gov/pmc/articles/PMC2029492/?page=1. 5. Wright, A. (1913). The unexpurgated case against woman suffrage. 6. Catty, N. (1913). The Unexpurgated Case Against Woman Suffrage, by Sir Almroth E. Wright. https://www.journals.uchicago.edu/doi/abs/10.1086/intejethi.24.3.2376614. 7. Wright, A. (1909). Studies on Immunisation: And Their Application to the Diagnosis and Treatment of Bacterial Infections. 8. Deploy vaccines to fight superbugs. Rappuoli et al. (2017). Nature 552:165-167.